Hemodynamic stress during hemodialysis (HD) results in recurrent segmental ischemic injury (myocardial stunning) that drives cumulative cardiac damage. We performed a fully comprehensive study of the cardiovascular effect of dialysis sessions using intradialytic cardiac magnetic resonance imaging (MRI) to examine the comparative acute effects of standard HD versus hemodiafiltration (HDF) in stable patients. We randomly allocated 12 patients on HD (ages 32–72 years old) to either HD or HDF. Patients were stabilized on a modality for 2 weeks before undergoing serial cardiac MRI assessment during dialysis. Patients then crossed over to the other modality and were rescanned after 2 weeks. Cardiac MRI measurements included cardiac index, stroke volume index, global and regional contractile function (myocardial strain), coronary artery flow, and myocardial perfusion. Patients had mean±SEM ultrafiltration rates of 3.8±2.9 ml/kg per hour during HD and 4.4±2.5 ml/kg per hour during HDF (P=0.29), and both modalities provided a similar degree of cooling. All measures of systolic contractile function fell during HD and HDF, with partial recovery after dialysis. All patients experienced some degree of segmental left ventricular dysfunction, with severity proportional to ultrafiltration rate and BP reduction. Myocardial perfusion decreased significantly during HD and HDF. Treatment modality did not influence any of the cardiovascular responses to dialysis. In conclusion, in this randomized, crossover study, there was no significant difference in the cardiovascular response to HDF or HD with cooled dialysate as assessed with intradialytic MRI. This study had two principle objectives: first, to perform the first intradialytic assessment of the acute cardiac effects of dialysis using cardiac MRI and second, to use this method to compare the acute cardiac effects of optimized conventional high–flux HD and HDF. Sixty patients established on HD were screened for eligibility, and 12 consented to participate (10 men; mean age =53±12 years old; dialysis vintage of 56±6 months). All had an arteriovenous fistula with mean flow rate (Qa) of 1051±60 ml/min. Demographic data are shown in Table 1. Dialysis treatment and laboratory data are shown in Table 2. Of note, HD and HDF resulted in comparable patient cooling (−1°C). There were no significant differences in UFV or other dialysis treatment or laboratory parameters between study arms, except for a larger fall in troponin T after HDF. BP was generally well maintained, with no significant differences between modalities at any time point (Figure 1A, Table 2). Five patients in each arm had a fall of >20% from baseline in at least one systolic BP (SBP) measurement, with an average maximum SBP fall of 18.1±10 mmHg during HD and 19.5±11 mmHg during HDF (P=0.70); there was only one episode of symptomatic hypotension. Heart rate did not change significantly throughout either dialysis treatment (Figure 1C), and no arrhythmias were observed. Stroke volume index (SVI) and cardiac index (CI) were independently assessed using phase contrast magnetic resonance imaging (PC-MRI) and cine MR data. The two methods gave tightly correlated results (r=0.61, P<0.001 for SVI; r=0.49, P<0.001 for CI); thus, for primary analysis, PC-MRI measures are presented. Cine MR data are provided in Supplemental Figure 1, including end diastolic volume and end systolic volume. SVI and CI both progressively decreased during treatment, with lowest values observed at 230 minutes (Figure 1B). No significant differences were found between modalities. For HD, baseline CI was 3.6±0.2 L/min per meter2 versus 2.6±0.2 L/min per meter2 at 230 minutes (P=0.001) compared with 3.3±0.2 L/min per meter2 versus 2.5±0.2 L/min per meter2 (P=0.001) for HDF. A reduction was also seen in inferior vena cava (IVC) flow, but no significant differences were found between modalities (Figure 1C). Cardiac output and systemic vascular resistance data are provided in Supplemental Figures 2 and 3 together with individual patient data showing changes in key parameters for HD and HDF. Significant reductions were seen in global circumferential and global longitudinal strains during HD and HDF (Figure 2A). During HD, global systolic contractile function deteriorated significantly, with longitudinal strain changing from −7.7±0.9% at baseline to −4.5±0.8% at 160 minutes (P=0.002) compared with from −8.6±0.8% (baseline) to −4.7±1.0% (160 minutes) for HDF (P=0.04). 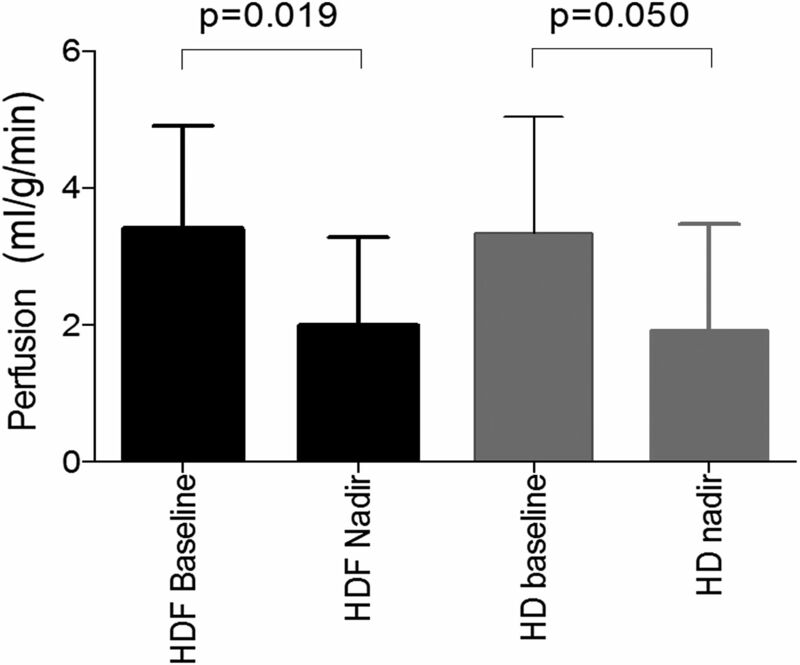 There were no significant differences between HD and HDF. Changes were seen as early as 70 minutes into dialysis treatment, with partial or complete recovery in the postdialysis period. Regional circumferential and longitudinal strains were each assessed in six LV segments, with eight patients showing two or more dysfunctional segments during dialysis (>20% reduction in strain from baseline) (Figure 2B). Mirroring changes in global strain, dysfunctional segments were detected at 70 minutes, with the highest number of affected segments at 160 and 250 minutes. There was no difference in number of dysfunctional segments between HD and HDF at any time point during dialysis; 30 minutes after the end of dialysis, strain returned to baseline in some but not all affected segments. 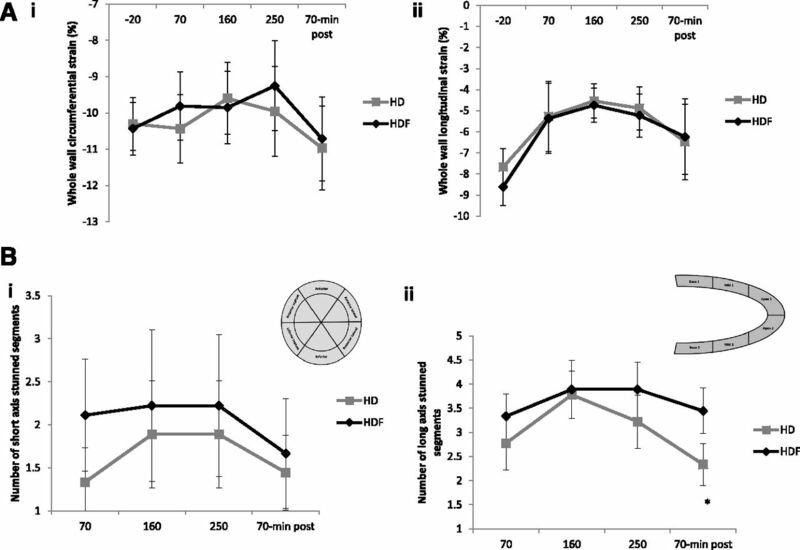 There were fewer persistently dysfunctional segments assessed in the long-axis view after HD compared with HDF (2.3±0.4 versus 3.4±0.5, respectively, P=0.001). There were no significant differences in fibrosis or myocardial water content (as assessed by myocardial T1 signal) at baseline or during dialysis (Figure 2, Supplemental Figures 4 and 5). Although there was no clear change in mean myocardial perfusion during dialysis, group-averaged values masked significant individual variation. Myocardial perfusion fell from baseline in seven patients (three ≥50%) during HD compared with five patients (four ≥50%) during HDF (chi-squared test between modalities P=0.36). 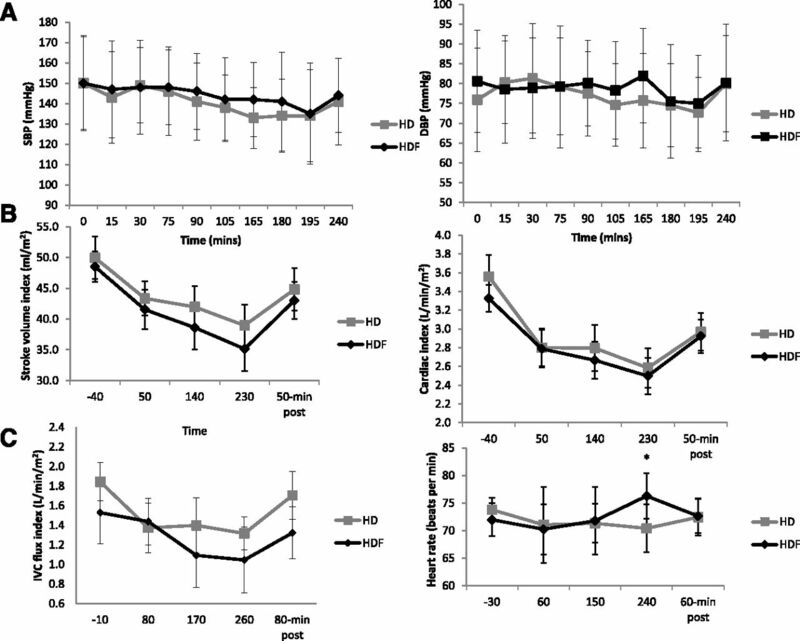 For HD, baseline perfusion was 3.3±1.7 ml/g per minute versus an intradialytic nadir of 1.9±1.4 ml/g per minute (P=0.05); for HDF, baseline perfusion was 3.4±1.5 ml/g per minute versus a nadir of 2.0±1.3 ml/g per minute (P=0.02). Nadir perfusion values did not differ between HD and HDF (Figure 3). Because of the limited spatial coverage of arterial spin labeling (ASL) imaging, it was not possible to formally match myocardial perfusion values to strain on a segmental basis. However, 78% of patients who had more than two short–axis dysfunctional LV segments during dialysis (same LV slice in which perfusion was measured) had a >20% fall in myocardial perfusion. During HD, four patients showed an early (55 minutes) fall in perfusion and three other patients evidenced a later fall (145 or 235 minutes) compared with three early decreases and two later decreases during HDF. A significant correlation was found between percentage decrease in perfusion from baseline to 70 minutes and number of stunned segments for HD but not for HDF. At baseline, there was no significant difference in right coronary artery flow between modalities (mean flux index =1.4±0.3 L/min per meter2, P=0.25). Coronary artery flow did not significantly change during dialysis, and there was no effect of treatment modality. The number of dysfunctional long–axis segments during dialysis was strongly associated with UFV (HD: r=0.70, P=0.02; HDF: r=0.59, P=0.05) (Figure 4Ai). In the short axis, a similar association was found for HDF (r=0.66, P=0.03) but not for HD (r=0.16, P=0.34), although fewer stunned segments were identified in this view. Reductions in SVI and CI during dialysis were both associated with increased UFV (Figure 4A, ii and iii). We also observed a trend toward greater UFV in those patients with a ≥20% fall in myocardial perfusion (0.91±0.7 L versus 1.5±0.5 L, P=0.06). No significant correlations were found between UFV and ejection fraction, heart rate, or IVC flow (as an indicator of venous return). In addition, reductions in SVI and CI were associated with the number of dysfunctional segments during dialysis (Figure 4B, i and ii). An association between BP and newly dysfunctional segments was also seen, with minimum SBP during dialysis correlating strongly with number of dysfunctional segments for HD (r=−0.8, P=0.01) (Figure 4Biii), although not for HDF. We have, for the first time, used intradialytic MRI to provide a comprehensive assessment of the short–term cardiac response to dialysis treatment. Using this approach, we observed significant intradialytic decreases in cardiac output, myocardial contractility, and myocardial perfusion but did not observe any differences between the short–term cardiac effects of HDF and conventional high–flux HD in the presence of cooling. The observed hemodynamic responses were in keeping with previous descriptions.19,20 However, using MRI, we have been able to accurately and directly measure cardiac output during dialysis for the first time. We observed a substantial decline in CI and SVI that reached a nadir at 230 minutes, with only partial recovery postdialysis. Heart rate remained relatively fixed, indicating a failure to respond appropriately to hemodynamic stress, a finding that is well described.21 Corresponding reductions in IVC flow and end diastolic volume suggest that changes in SVI and CI were at least partly related to reductions in intravascular volume. However, the negative effects of dialysis on ventricular contractility also appeared important, with correlations between change in CI and number of newly dysfunctional segments. Ventricular contractile performance was assessed using LV strain, with longitudinal strain being the most sensitive measure, because the subendocardial distribution of longitudinal fibers renders them particularly prone to hypoperfusion.22 We observed reductions in both longitudinal and circumferential global strains during dialysis, although longitudinal changes were most notable. These global reductions were associated with regional/segmental dysfunction. Regional assessment of myocardial contractility in tandem with perfusion allowed us to study the development of myocardial stunning more precisely, showing coexisting reductions in contractile function and perfusion and only partial recovery postdialysis. The pattern of injury and peak of the effect were in keeping with echocardiography-based studies performed by our group and others.6,23 We observed myocardial stunning as early as 70 minutes from the start of treatment, consistent with early changes in myocardial perfusion described in PET studies.9 This implies that, although UFV remains a key driver of myocardial stunning, additional processes also contribute to regional cardiac injury. The fact that dialysis-induced stunning occurs even within modest changes of BP and volume status suggests that there is no threshold of risk that can be determined from current clinical–based approaches to assessment. Despite randomized, controlled trials exploring long–term clinical effects and the results of our short-term study, it remains unclear why HDF may have cardioprotective effects. The Turkish HDF Study and the CONTRAST Study found no difference in mortality or cardiovascular events,15,16 whereas the ESHOL Study reported a large (30%) reduction in all-cause mortality.17 This evidence base is further complicated by the divergent results of four meta-analyses, all of which showed reductions in IDH with HDF, but only one suggested improved patient outcomes.11–14 A more recent pooled individual participant data analysis suggested a survival benefit with HDF, particularly with higher convection volumes.18 Although we observed no significant differences between HD and HDF in any of the short-term effects studied, it remains possible that HDF may be associated with improved intradialytic stability in more frail patient groups with higher UFV. It should be noted that we selected relatively healthy patients for this first intradialytic MRI study with well preserved ejection fraction (although baseline strain values were reduced compared with normal values), relatively stable intradialytic BP, and low UFV. The matched fall in body temperature that occurred during study sessions may also be relevant, because dialysate cooling improves intradialytic hemodynamic stability and provides short- and long-term cardioprotection.24,25 Previous studies have shown equivalent incidence of IDH between HD and convective techniques after controlling for thermal factors.26 It remains possible that HDF may be associated with improved intradialytic stability in the long term related to the cooling effect of large convective replacement volumes. HDF does provide superior solute removal over a wide molecular weight range compared with conventional HD, explaining the observed greater clearance of troponin T during HDF. There may be additional unknown short–term effects associated with the removal of other factors, such as cardiotonic steroids, which have been experimentally associated with the development of uremic cardiomyopathy,27 but this remains speculative. T1 relaxation measures can provide an indication of the degree of myocardial fibrosis as collagen becomes associated with a supersaturated hydrogel and increases the water-based signal,28 whereas a change in T1 during dialysis would indicate altered myocardial water content. Our cohort had relatively normal baseline T1 values, suggesting a low level of cardiac fibrosis, and a lack of change in T1 during dialysis indicates no change in myocardial water/edema due to UFV or osmolality changes. However, additional study of these measures may provide additional insights across a wider patient demographic. The application of advanced cardiac MRI during dialysis is a major step forward toward understanding the pathophysiology of elevated cardiovascular mortality in patients on dialysis. We have confirmed the development of myocardial stunning during optimal dialysis schedules and shown that cardiac MRI now provides an integrated tool for the discovery of new dialysis–based therapeutic targets, refinement of candidate interventions, and ascertainment of robust biologic plausibility before large-scale studies to improve intradialytic hemodynamic stability directed at hard clinical end points. In the setting of this study of stable cooled patients, HDF and high-flux HD were associated with similar short–term intradialytic cardiac effects. Patients were recruited to the study from the renal unit at the Royal Derby Hospital (ClinicalTrials.gov no. NCT02494843). One of the investigators (A.M.) was responsible for enrolling participants. Ethical approval was grant by the Derbyshire Research Ethics Committee, and all patients gave written informed consent. All patients had received thrice weekly HD for >6 months and had a mature arteriovenous fistula. Patients were excluded if they fulfilled the criteria for New York Heart Association Class 4 cardiac failure. This was an open label, randomized, crossover pilot trial (Figure 5A). 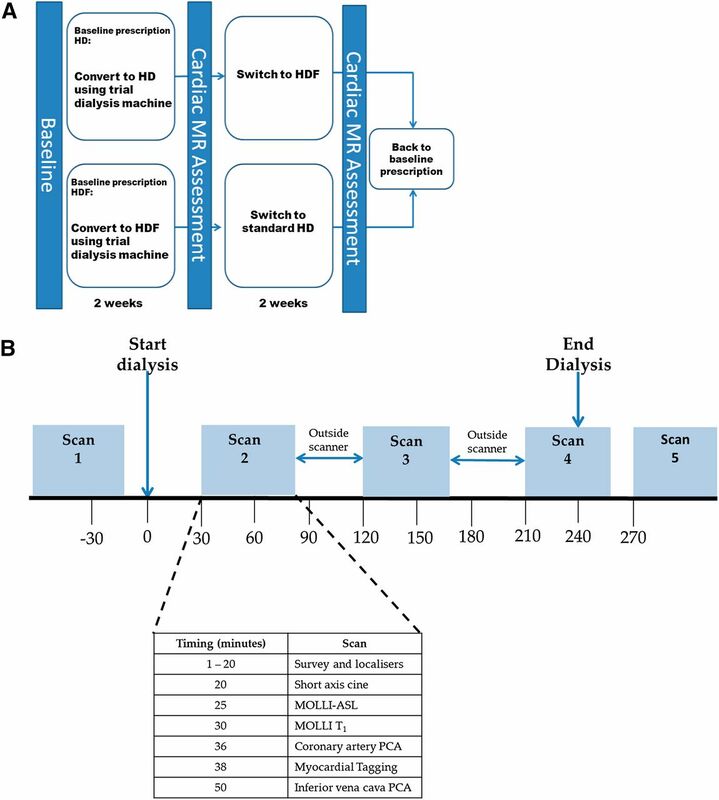 Participants were randomized 1:1 to HD or HDF for 2 weeks using a computer–generated randomization sequence (Prism; GraphPad, San Diego, CA), after which they underwent multiparametric cardiac MRI scans before, during, and after a single dialysis treatment (Figure 5B). Clinical parameters, dialysis treatment details, and laboratory tests were obtained before and after dialysis. Thereafter, participants switched to the other modality for another 2 weeks before attending for a second MRI study day. During the 2-week run-in phases, dry weight was assessed as per standard clinical practice, and dialysis was performed with the same equipment as used on study days: Fresenius 5008 monitors, high–flux polysulfone dialyzers (FX800; Fresenius Medical Care, Bad Homburg, Germany), bicarbonate buffer, and dialysate temperature at 37°C. For HDF, a minimum of 20 L replacement fluid per treatment was targeted. Anticoagulation was achieved using unfractionated heparin, and dialysate composition was sodium, 137 mmol/L; potassium, 2.0 mmol/L; calcium, 1.5 mmol/L; magnesium, 0.5 mmol/L; and glucose, 1.0 g/L. Cardiac MRI data were collected on a 3T Philips Achieva MR Scanner (Philips Medical Systems, Amsterdam, The Netherlands) using MultiTransmit and a 16–channel TorsoXL Receive Coil. There were a number of considerations to allow dialysis to be performed in the MR scanner as described in Supplemental Appendix. Cardiac MRI data were collected at five time points (Figure 5B) and comprised multiple measures of cardiac structure and function alongside VCG measures of patient heart rate in a 50-minutes scan session. MRI measures are summarized below, and full technical details are provided in Supplemental Appendix. LV function was assessed using VCG–gated cine MRI to collect images of the LV across the cardiac cycle in the two-chamber (2CH) view. Data were analyzed using ViewForum software (Philips Medical Systems). Cardiac output, stroke volume, and ejection fraction were determined. Stroke volume and cardiac output measures were corrected for body surface area (BSA) to yield SVI (liters per square meter) and CI (liters per minute per square meter). PC-MRI of aortic flow was collected to provide a second independent estimate of SVI and CI, whereas PC-MRI of the IVC was used to determine central venous return. PC-MRI data were analyzed using ViewForum software to provide an estimate of aortic blood velocity (millimeters per second), cross-sectional area (CSA) of the aorta (square millimeters), and aortic strain (percentages), from which SVI and CVI could be obtained. For the IVC, velocity (millimeters per second), flux (liters per minute), and CSA (square millimeters) were calculated, with flux and CSA being BSA corrected. Myocardial fibrosis was assessed in a 2CH short–axis slice using a modified Look-Locker Inversion Recovery (MOLLI) T1 mapping scheme.30 MOLLI data were analyzed using dedicated software to form short–axis T1 maps (in milliseconds) of the myocardium (Matlab version 8.1; The MathWorks, Inc., Natick, MA). PC-MRI was used to estimate flow in the right coronary artery. Using ViewForum software, the CSA (square millimeters), flux of blood through the coronary artery (millimeters per minute), and stroke volume (millimeters) were calculated and BSA corrected. Myocardial perfusion was assessed in a 2CH short–axis slice with an MOLLI ASL technique31 using a flow alternating inversion recovery scheme. Myocardial perfusion data were quantified in units of millimeters per gram per minute (Matlab version 8.1). Statistical analysis was performed using SPSS v22. Results are expressed as mean±SEM and median (interquartile range) for parametric and nonparametric data, respectively. Paired t test (or nonparametric equivalent) or repeated measures ANOVA was used to compare variables over two or more time points and between modalities. Correlations were performed with Pearson tests. The null hypothesis was accepted for P values ≥0.05. K.K. and B.C. are full-time employees of Fresenius Medical Care (Bad Homburg, Germany). The authors dedicate this study to the memory of our recently deceased friend and Chief Renal Technician, Paul Roome. We could not have overcome the technical challenges posed by this or numerous other studies over the last 10 years without his amazing expertise and unfailing can do attitude. This study was funded by a research grant from Fresenius Medical Care Deutschland GmbH. See related editorial, “Changes in Cardiac Output and Perfusion during Hemodialysis and Hemodiafiltration Treatments Determined by Cardiac Magnetic Resonance Imaging,” on pages 1013–1015. This article contains supplemental material online at http://jasn.asnjournals.org/lookup/suppl/doi:10.1681/ASN.2016060686/-/DCSupplemental.